Muscles of the gluteal region: The gluteal region is located posteriorly to the pelvic girdle, at the proximal end of the femur. It can be described as an area of buttocks. There are two gluteal regions, left and right. The muscles in the gluteal region move the lower limb at the hip-joint. Superficial abductors and extenders – Muscles that abduct and extend the femur. Superficial group muscles are- gluteus maximus, gluteus medius, gluteus minimus and tensor fascia lata. Deep lateral rotators-Muscles that largely act to laterally rotate the femur. 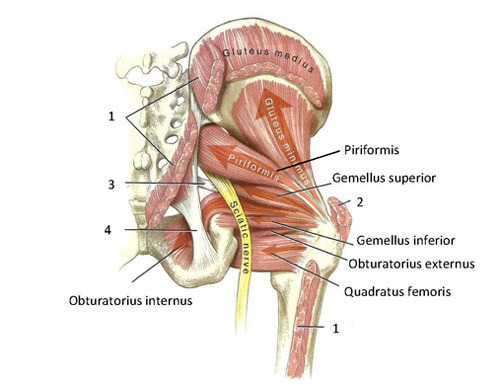 Deep lateral rotators muscles are- piriformis, gemellus superior, gemellus inferior, quadratus femoris and obturator internus. Gluteus Maximus: The gluteus maximus is the main extensor muscle of the hip. The gluteus maximus is the largest and most superficial gluteal region muscles. Its thick fleshy mass, in a quadrilateral shape, makes the distinction of the buttocks. Gluteus Medius: The gluteus medius is a broad, thick, radiating muscle, situated on the outer surface of the pelvis. The gluteus medius posterior third is covered by the gluteus maximus, its anterior two-thirds by the gluteal aponeurosis. 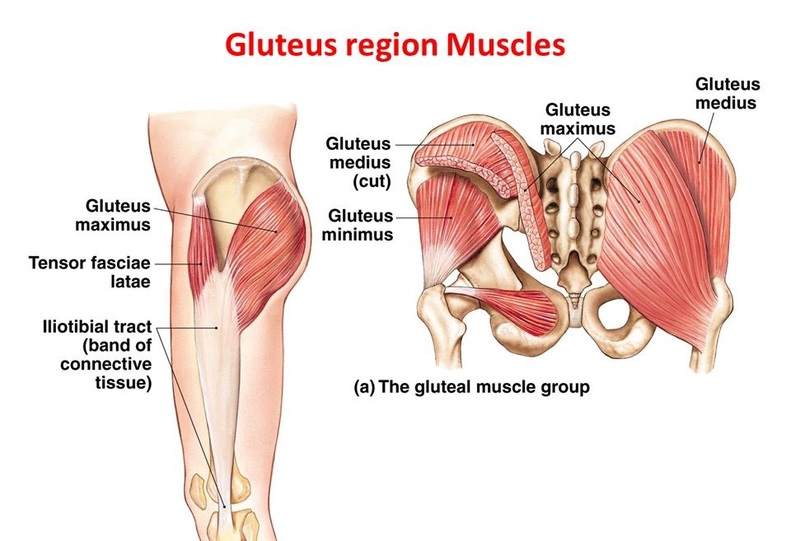 Gluteus Minimus: The gluteus minimus is the tiniest of the three gluteal muscles, the gluteus minimus muscle is situated immediately beneath the gluteus medius. Tensor Fasciae Latae: The tensor fasciae latae is a tiny muscle, It is associated with the gluteus maximus in function and structure and is continuous with the iliotibial tract, which connects to the tibia. This band, also described the IT band— located in the thigh and knee. The muscle assists in preserving the balance of the pelvis while walking, standing, or running. Piriformis: The piriformis is a muscle in the gluteal region. The piriformis muscle is one of six deep lateral rotators of the hip including is one of only three muscles that attach the legs to the spine. Gemellus Superior: The Gemellus superior, the smaller of the two gemellus muscles.The gemellus superior and gemellus inferior help to laterally rotate the extended thigh. Gemellus Inferior: The Gemellus inferior originates from the upper part of the tuberosity of the ischium, The gemellus superior and the gemellus inferior aid to laterally rotate the extended thigh. Obturator Internus: The obturator internus muscle arises on the medial surface of the obturator membrane, the ischium near the membrane, and the rim of the pubis. Obturator Externus: The obturator externus muscle is a flat, triangular muscle, which covers the outer surface of the anterior wall of the pelvis. Quadratus Femoris: The quadratus femoris is a plane, quadrilateral muscle. Positioned on the back side of the hip joint, it is a powerful external rotator and adductor of the thigh but additionally acts to stabilize the femoral head in the Acetabulum. Hip Flexion: Forward and upward movement from the femur through the hip happens in the sagittal plane about a medial-lateral axis. Hip Flexor Muscles-iliopsoas, rectus femoris, sartorius, pectineus. Hip Extension: Upward movement toward the rear of the body of the femur at the hip occurring in the sagittal plane. Hip Extensor Muscles-gluteus Maximus; semimembranosus, semitendinosus and biceps femoris (the hamstrings). Hip Abduction: Movement of the femur on the hip in a direction away from the midline of the body in the frontal plane. Hip Abductor Muscles-gluteus medius, gluteus minimus and tensor fascia latae. Hip Adduction: Movement of the femur on the hip in a direction toward the midline of the body in the frontal plane. Hip Adductor Muscles-adductors longus, brevis and magnus, pectineus, and gracilis. Hip Internal Rotation: Rotation of the femur toward the midline of the body in the transverse plane. Hip Internal Rotator Muscles-anterior fibers of gluteus medius and minimus, tensor fascia latae. Hip External Rotation: Rotation of the femur away from the midline of the body in the transverse plane. Hip External Rotator Muscles-biceps femoris, gluteus maximus, helped by the obturators, gemilli and quadratus femoris.